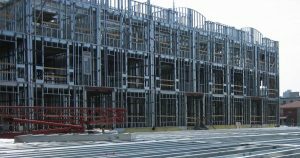 The American Iron and Steel Institute (AISI) has published a new cold-formed steel research report on load bearing clip angle design. The report presents the second phase of a research project aimed at developing design methods for three limit states of cold-formed steel clip angles—shear, compression, and pullover of the screw connections. “RP18-4: Load Bearing Clip Angle Design – Phase II” is available for a free download. During the first phase of the research, new design methods were developed for the three limit states. Load and Resistance Factor Design (LRFD) and Limit State Design (LSD) resistance factors and Allowable Stress Design (ASD) safety factors were also provided to apply to the proposed design equations for nominal strength. In the second phase, the research focused on investigating: 1) the fastener pattern effects on the behavior and strength of clip angles, 2) the serviceability of clip angles subjected to tension, and 3) the design of clip angles subjected to combined shear and bending with different boundary locations.